Wednesday October 17, 2018. Chessington World of Adventures Resort announced a new and enchanting addition to the Surrey Theme Park and Zoo for spring 2019. ‘Room on the Broom – A Magical Journey’, brings to life yet another of author Julia Donaldson and illustrator Axel Scheffler ’s much-loved children’s stories, following in the footsteps of the Resort’s Gruffalo River Ride Adventure. Families will be invited to visit the enchanted library and embark on their own spellbinding adventure. As the stormy wind blows, sending Witch’s hat, bow and wand tumbling to the ground, parents and children alike will have to search high and low in trees, fields and reeds helping Dog, Bird and Frog on their way to find the lost belongings. Guests will have to watch out though for a fearsome foe, Dragon, who fancies ‘Witch and chips’ for his tea! Julia Donaldson, added: “It’s lovely that families will be able to enter the Room on the Broom world and enjoy the story in a new way at Chessington World of Adventures Resort”. 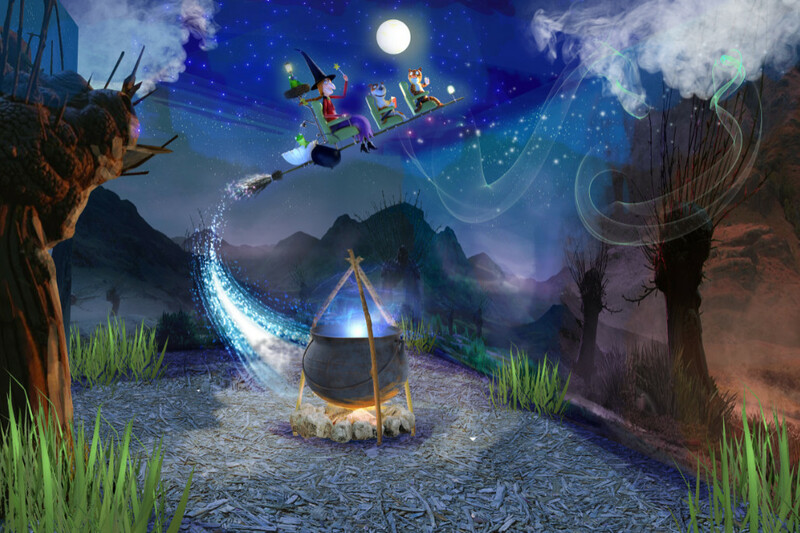 ‘Room on the Broom – A Magical Journey’ is set to open at Chessington World of Adventures Resort in spring 2019 and will be accompanied by two themed Room on the Broom bedrooms in the Chessington Safari Hotel. For more information, visit Chessington.com/2019. Equally visit the Resort during Howl’o’ween (on until Saturday November 4) to receive an exclusive voucher to return in 2019 for just £10. ‘Room on the Broom – A Magical Journey’ is being created in partnership with the license holders, Magic Light Pictures Ltd.
© 2001 & TM Julia Donaldson & Axel Scheffler. Licensed by Magic Light Pictures Ltd.
© Orange Eyes Ltd. 2012.